When asked about famous places in Nakama City, most people first think of Habu Park, the largest municiple park in the city. Crossing over the red bridge spanning its pond leads you to the shrine’s precincts where you will find lots of greenery and a dense growth of plants throughout all four seasons. 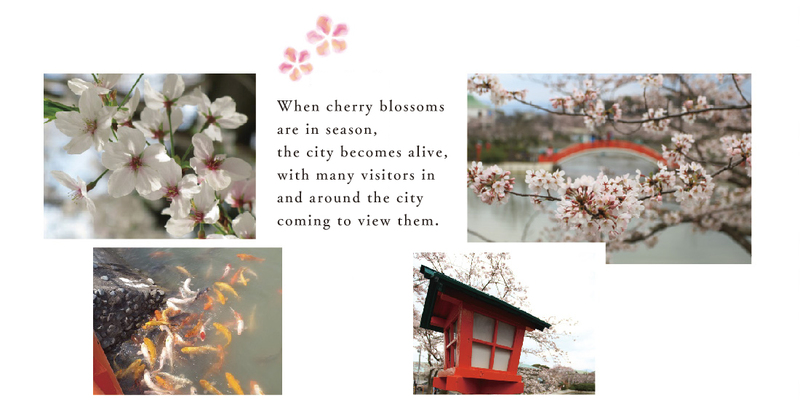 The shrine is famous in particular for its cherry blossoms, and the harmony between the cherry blossoms and the red bridge is exquisite when viewed from a boat on the pond in spring. Approx. 5-minute walk from Chikuzen Habu Station ont he JR Chikuho Line The largest municiple park in the city. This is a group of horizontal caves centered on Mt. Rakan located inside the park, created as tombs during the latter part of the Kofun period (about 1,400 years ago). A large number of burial accessories have been found in the tombs, which are now on display at the Museum of History and Folklore. The interior of the tombs resembles residences of that era. It is believed that the construction took 200 years to complete. The ruins were designated an Important Cultural Property by Fukuoka Prefecture in 1957. This is a lush green park built in 1989 which utilized the ruins of the former Katsuki Railroad Line, becoming “Nakama City’s new famous sightseeing spot.” This is actually a unique open-air museum with rows of stone statues, measuring 7 meters wide and about 400 meters in the total length. The long and narrow site is divided into four sections, including the “Creation of Space for Tranquility” and “Returning to Antiquity.” It features over 30 replicas of the moai stone monoliths of Easter Island, sphinxes, and other famous stone replicas from around the world. The abundantly green space creates the feeling for visitors that they are viewing actual ancient ruins. It is, of course, free to enter and is open all year round. This is a railroad built by the Chikuho Industrial Railroad Company in 1891 to transport Chikuho coal more efficiently, and it created the opportunity for the first steam locomotive to travel through Nakama City. These brick bridge piers were built at the time of the opening of the railroad. on the JR Chikuho Honsen Line. 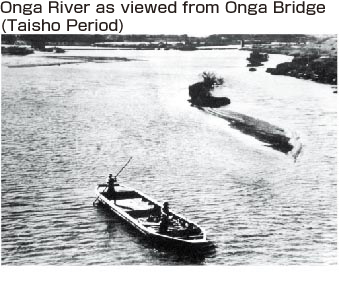 During the Meiji Period, river boats plied the waters of the Onga River carrying coal from the Chikuho Coal Fields to Wakamatsu Port. For a period of time, the coal fields supplied half of the coal used in Japan. The Onga Bridge connects Nakama City in the east-west direction. 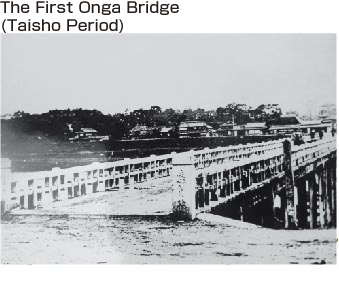 With the progress of industry during the end of the Meiji Period, transportation systems developed and the Onga Bridge was built over the Onga River in 1919. The current bridge is the third generation of the bridges, the first one being constructed of wood. refreshment to enjoy the natural environment up close. Approx. 17-minute walk from Nakama Station on the JR Chikuho Honsen Line.